Movable books were originally created to illustrate ideas about astronomy, fortune telling, navigation, anatomy of the body, and other scientific principles. Most commercial pop-up book publications today are geared towards children, but pop-up book structures can be used to make engaging works of art for any age, from greeting cards to animations to kinetic sculptures. Complex and engaging pop-up structures are created from a combination of basic mechanisms enhanced by play and imagination. In this workshop, participants will learn the basic elements of pop-up paper engineering as well as more complex mechanisms including platforms, rotating discs, and pull-tabs. Participants will learn how to incorporate their own art into their structures effectively to create unique pop-up books, cards, and works of art. All levels of experience are welcome. 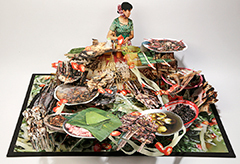 Colette Fu makes pop-up books using photographs from her travels around the world. After receiving an MFA in Fine Art Photography from the Rochester Institute of Technology in 2003, Colette began devising complex compositions that incorporate photography and pop-up. 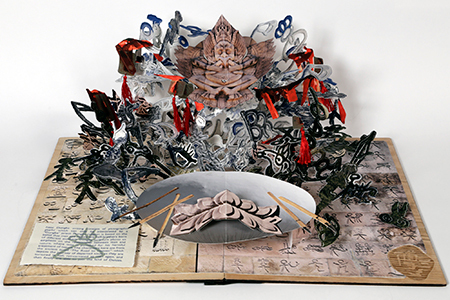 Her pop-up books are included in the Library of Congress, the National Museum of Women in the Arts, the West Collection, and many private and rare archive collections. Colette’s numerous awards include a Fulbright Research Fellowship to China, and grants from the Independence Foundation, Leeway Foundation, En Foco, Pennsylvania Council on the Arts, Puffin Foundation, and Society for Photographic Education. Colette is also a passionate educator who teaches pop-up courses and community workshops with marginalized populations at various art centers, universities, and institutions nationally and internationally. 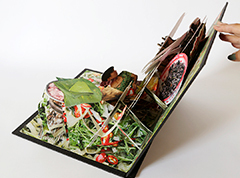 I make one-of-a-kind collapsible artist’s books that combine my photography with pop-up paper engineering. Pop-up and flap books originally illustrated ideas about astronomy, fortune telling, navigation, anatomy of the body, and other scientific principles. This history prompted me to construct my own books reflecting ideas on how our selves relate to society today. After college graduation I went to my mother's birthplace of Yunnan Province in Southwest China to teach English. With snow-capped mountains to the Northwest, and tropical rainforests to the South, Yunnan is rich in natural resources and has the largest diversity of plant life in China. This diversity extends to its population as well. 25 of the 55 minority groups of China reside in Yunnan and comprise less than 9% of the nation’s population, with the Han representing the majority. Many people inside China and most people outside are unaware of this cultural richness. While in Yunnan I discovered that my great-grandfather was a member of the powerful black Yi tribe, and governor and general of Yunnan during the transitional years of World War II. I stayed in Yunnan and traveled throughout the province for three years; it was these experiences that helped me find a new sense of pride and identity and encouraged me to pursue a profession as a photographer and artist. With the help of a Fulbright fellowship, I traveled back to Yunnan to photograph and create pop-up books of the minorities of China. Race, language, culture, religion, and history are at the core of a minority’s classification, but major historical events, like the Great Leap Forward and the building of the Yunnan-Vietnam railway, and their accompanying “outside” cultural influences and developments, have begun to change the minority tribes as they are quickly assimilating with the Han majority. These ethnic groups have customs, histories, religious practices, languages, and lifestyles that greatly differ from their Han majority neighbors. While I am directly unable to help these groups preserve their identity and ways of living, I can use my skills as an artist to spread knowledge and provide just a brief portrait of their existence. My pop-ups are a way for me to speak and inform; the real and implied motion in the pop-ups link to a temporal element, and an inevitable corollary is to awe and unsettle. Constructing pop-ups allows me to combine intuitive design and technical acuity with my love of traveling as I try to understand the world around me. 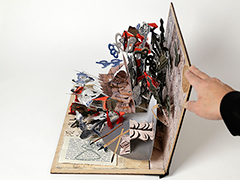 With pop-up books I want to eliminate the boundaries between book, installation, photography, craft, and sculpture. Any designs, illustrations, drawings, sketches, photographs (glossy not recommended), magazines you may want to work with. Digital images on a storage device you may want to print out to use on the laser printer. Participants should also bring any 2D paper based art that they might want to incorporate with their pop-ups. These can include drawings, matte photographs, and laser prints.